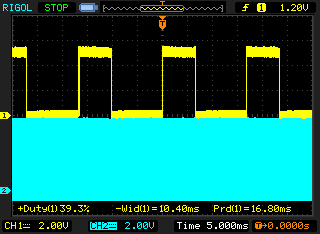 Lower trace (2V/5µS/div): 3.3V input @ 25Khz ~50% duty. Upper trace (2V/5µS/div): 5V output of the opto-isolator. 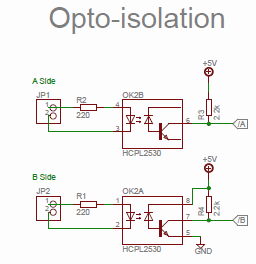 As mentioned previously, the output from the opto-isolator is inverted from the input signal. It's also clear that the switch on/off characterists aren't the same. 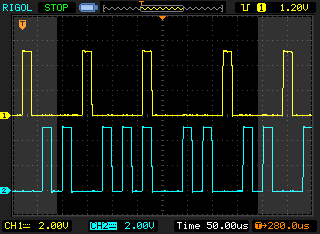 The 5V signal falls in ~1µS, but takes ~3µS to rise. Passing this thru digital logic chips may help square up the transitions. 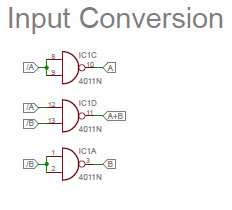 Lower trace (2V/5µS/div): 3.3V input @ 25Khz 50% duty. Upper trace (2V/5µS/div): 5V output of the inverter (NAND gate). After passing thru the inverter (NAND gate), the edges certainly are squarer. The slowness of the low-high transition at the opto-isolator (~3µS) has resulted in a noticable (~0.5µS) slope on the high-low transition out of the 4011 NAND gate. I really don't think this is a problem, but could be addressed by using a 4093 (Schmitt Triggered) version of the NAND chip (a whopping $0.02 extra per chip). Upper trace (5V/5µS/div): gate drive to the lower mosfet. Upper trace (5V/5µS/div): gate drive to the upper mosfet. The gate drive to the upper mosfet. 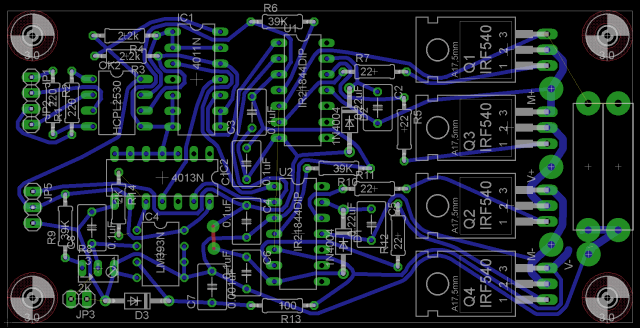 As soon as the 3.3V input goes low, the upper mosfet is switched off. But when the 3.3V input goes high, there is a slight delay before switching on - to allow the lower mosfet time to fully switch off(deadtime). Lower trace (5V/5µS/div): gate drive to the lower mosfet. The gate drive to both upper and lower mosfets. Remember, the duty cycle wasn't setup at exactly 50%. 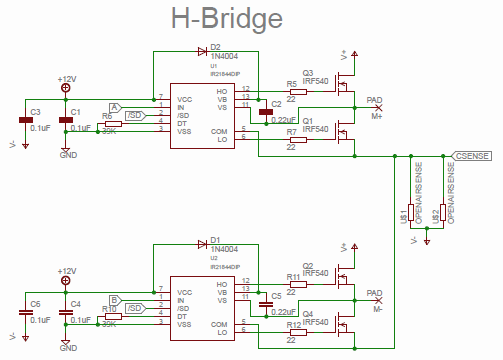 Dual traces (5V/5µS/div): gate drive to the upper & lower mosfets overlaid. The dead time is blatantly obvious here. 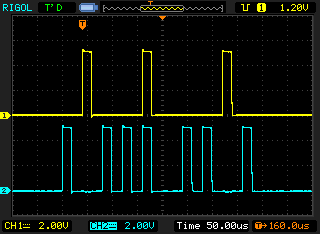 You can see the ~1µS delay between switch off of one mosfet & switch on of the other. I've heard that 500nS should be plenty, and this could easily be adjusted by changing the deadtime resistor connected to the IR21884. Dual traces (5V/5µS/div): gate drive to the upper & lower mosfets overlaid with 10V motor & supply connected. Up until this point, I hadn't supplied any voltage on the motor supply terminals. Therefore (referenced to ground), the voltage on the upper gates was simply the gate supply (12V). To turn on N-channel mosfets you must provide a positive voltage at the gate relative to the source. For a high-side mosfet, where the mosfet source is intended to supply the motor at full motor voltage, this means the gate voltage must be above the motor supply voltage. The taller of the two pulses is the high-side gate (the smaller, the low-side gate). With 12V for gate supply, and 10V motor supply, you can see the boot-strap circuitry is producing a ~20V (relative to ground) gate voltage for the high side, and ~12V for low side. I'm not sure about the ringing that's visible. It may be coming from the motor that was connected at the time, or it could have been EM picked up by the probes - I'm not really sure. Dual traces (5V/2µS/div): Zoom of gate drive to the upper & lower mosfets overlaid with 10V motor & supply connected. Lower trace (50mV/5µS/div): Current sense input. Here's the gate drive voltage & current sense resistor voltage. You can see how after turn on, the voltage across the sense resistor rises as the motor's inductance allows current to increase. It also shows the reverse (negative) current cased by back EMF flowing thru the sense resistor after turn-off (0V is actual the "0%" horizontal line on the bottom trace). Upper trace (50mV/5µS/div): Current sense input. Catching the comparator's output on my analog scope provded quite tricky (maybe I need a new DSO), because as soon as the comparator switched on, the mosfets switch off and the comparator switched off again. So this is the current sense & output from the latch (being reset by the comparator). The current reference was set to 50mV which thru a single 20mΩ current sense resistor is 2.5A. 0V on the top trace is the 4th horizontal line from the top. When the current sense voltage reached 50mV, the enable line to the mosfet drivers was shut-off (which stopped further current increases). The enable line would then by set high again by the next rise in the A or B inputs. Upper trace (5V/10µS/div): high mosfet gate drive. Here's a perfect shot the current limiting in action. During the first cycle the gate switches on and off as commanded. During the second cycle, the current limit is exceeded resulting in the enable line being sent low (switching off the mosfet). The 3rd cycle (left most side - we can only see the start of it) sets the enable line high again, and switches the mosfet on again. It's all appears to be functioning as designed... Yippee! But if I did this for a living (especially documenting it)... a nice big 4 channel DSO would be in order. One of the issues I've had during development of my servo controller are the limitations around accurate signal creation & capture. A 1440 pulse per revoltion encoder at a modest 3000 RPM results in 72,000 transitions a second - every 14μS. 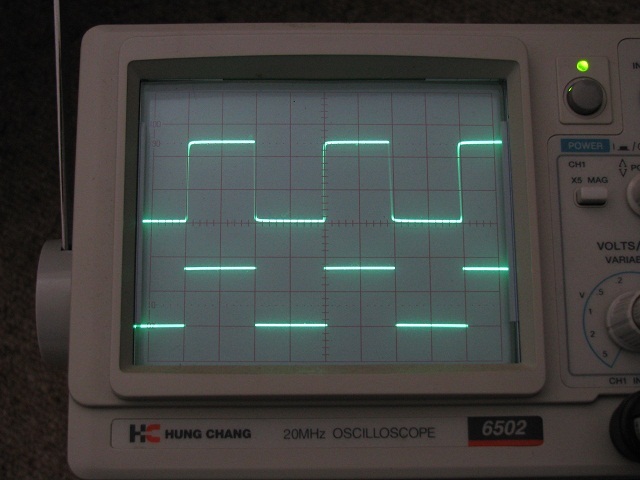 A PWM cycle @ 40Khz lasts just 25μS, with a 1% duty cycle adjustment being 250nS. Input step signals from controllers such as Mach3 are often expected to capture pulses as short as 1μS. Enter field-programmable gate arrays (FPGAs). If you're not aware, FPGAs are chips filled with "logic blocks", and reconfigurable interconnects. A hardware description language (HDL) or schematic tool is used to describe the desired function. "Synthesis" then converts this into a "netlist" of gates and connections. "Place and route" finally maps the design into the targetted FPGA device - which "logic blocks" to use for what and how to connect them (this is the most complex and time consuming part of the "build" process). The resultant bitstream can then be loaded into the device. So, how much can you achieve with such a device? With enough real-estate for about two basic AVR processors, Xilinx's XC3S250E with 5,500 logic cells & 66 I/O can be had for ~$15. Meanwhile, a single XC6VLX760 chip with 760,000 logics cell & 1,200 I/O pins and will set you back ~$20,000 (and they've just announced a 3 times larger XC7V2000T with ~2 million logic cells!). This all sounds good, but these high-tech devices can often be a right pain for the DIY hacker - expensive or difficult to source in small quantities, requiring complex support circuitry, physically difficult (fine pin pitch or BGA), etc. What you want, is someone to do the dirty work for you - put together everything in a nice module. $99 - SparkFun's Spartan 3E Breakout and Development Board (XC3S500E). Medium gate density - 100K is too small. 1000K is too much. 250K to 500k. Onboard ROM - FPGA's need their configuration loaded after power-up & you don't want to connect a PC every time. Medium number of IO pins - I need more than a few & less than a few hundred. Probably a few dozen. USB programability - I want a device programmable via USB from my PC. USB host device - I want a device usuable from my PC. No human interface - if I want buttons or an LCD panel... I'll add it myself. Plug in module - physical form suitable for inclusion in other projects. Open Hardware - I want something I can tear apart & understand. Community support - I don't want to be alone! I ended up settling on GadgetFactory's Papilio One (250K). I didn't think I needed the 500K version, and figured I could always get one later if needed. Let the FPGA learning begin! P.S. I found another review of cheap FPGA development boards. P.S. (25-Jun-2011) Just found a new highly featured Altera based Terasic DE0-Nano board. At absolute bargain at $79 (considering the FPGA EP4CE22F17C6N & configuration flash EPCS16 chips alone would cost me $66 + $14 from Digikey).